Bella loves music and singing. 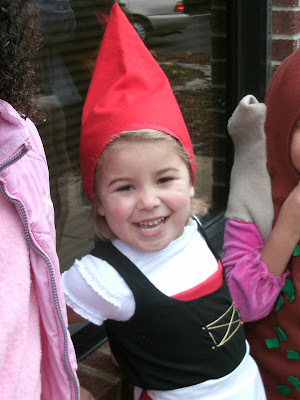 Therefore, it was no surprise to me when she fell head-over-heels in love with Gnomeo and Juliet this summer. Don't get the connection? Let me tie it together: Elton John and Lady Gaga, baby. Bella can (and does) sing every song from Gnomeo and Juliet but the Elton/Gaga duet "Hello, Hello" is her absolute favorite. After her 15th viewing of the movie, she looked over at me and informed me she'd be "that Juliet ninja" for Halloween. 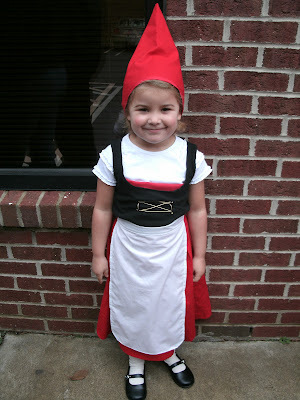 I may pride myself on putting together a good costume, Ninja Juliet wasn't in the cards. 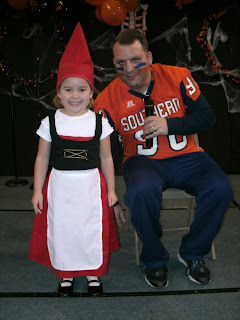 Instead, we went with a good ol' fashioned gnome. And Bella loved it. A rose like Juliet is supposed to hold. A green frog for "Nurse"
The only handicrafting you have to do is turning the black shirt into Juliet's vest. I cut the sleeves at the seam and then cut a scoop neck in the front (leaving the back intact). Use the gold embroidery thread to sew a box, an X inside the box, and then put little knots outside each corner of the box. Use the black thread to attach a strip of red fabric (or felt) to the inside of the shirt so that it peeks out of the front. If using red felt for that hat, create a cone shape and secure with a safety pin or a few stitches. Dab on a little red lipstick on the child's lips and make two red circles on her cheeks. This is optional and didn't stay on very long for us. And I couldn't let Halloween pass without sharing this little bit of love from Javi's third Halloween. Can you spot my big football player? See previous costume posts here: Pippi Longstocking, Sir Javi, and Pirate. and long days of upper-70s sunshine. But the noise. Oh, the noise. and everything else, and my chicken. lay still until dark mercifully arrives. The only way to quiet her? to receive -- is the luscious grape. 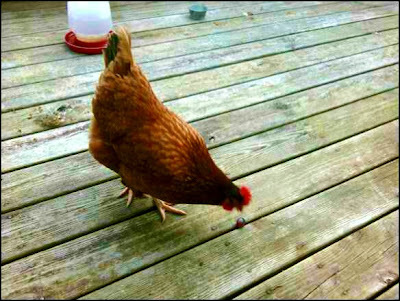 and damn picky -- Miller family pet. Get dressed in the dark pants and light shirt. Add the sash/belt. We double wrapped the pashmina to give some girth. Add the hat, eye patch, and other accessories. Yes, the hat and eye patch didn't last very long. 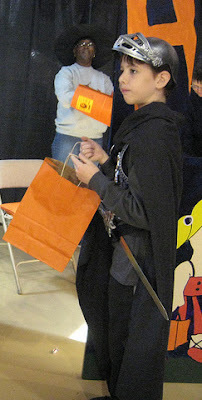 However, Javi trick-or-treated with kids dressed as Transformers and super heroes in store-bought costumes. Not once did he comment that his costume wasn't as good as their's. He really appreciated the creativity behind it! 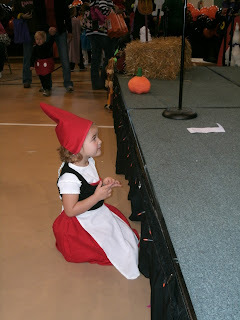 Coming up: Juliet the Gnome. Previous: Pippi Longstocking and Sir Javi. 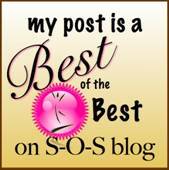 This post is linked to: The DIY Showoff, Get Your Craft On, Wordful Wednesday, Way Back When-esday, Works for Me Wednesday, and Somewhat Simple. Who doesn't love a knight in shining armor? 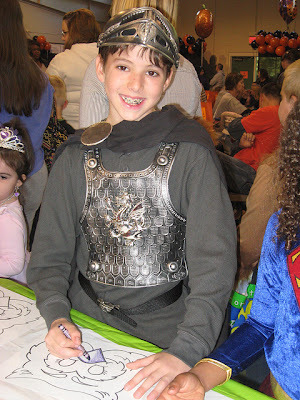 Well, let's say a knight in plastic-painted-to-look-burnished armor ... which is what Javi dressed up as for Halloween last year. Sadly, he's decided he's too old for trick-or-treating this year. Instead, he'll wear all black and scare kids. Milestones! A square of aluminum foil. Get dressed in the black/gray shirt and pants. Add the chest plate and belt. Drape the sheet (or cape if you have one) at an angle around the shoulders. Make sure it bunches and hangs off the shoulders a bit. Secure with the safety pin. Crumple the aluminum foil and then spread it back out. Use a black marker and a cotton ball to "distress" the foil by smudging ink around it. You can skip this step and go with a shinier/smoother look if you want. Wrap the foil around the pin and then stick the pin where the safety pin is. Add the helmet and accessories. 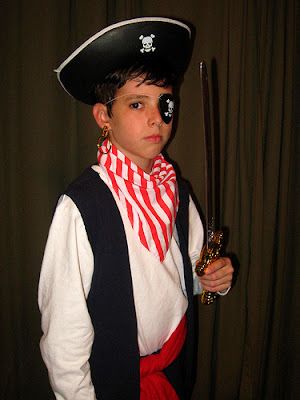 *Javi wore two costumes because he had sensory issues with this one. Specifically, he couldn't stand the weight of the sheet or the feel of it on his shoulders. He wound up ditching it right after the above picture was taken. If your kiddo has sensory issues, perhaps a lighter-weight sheet (his was king sized) or a real cape is a better bet. Coming up: A pirate, a wrestler, and an angel. 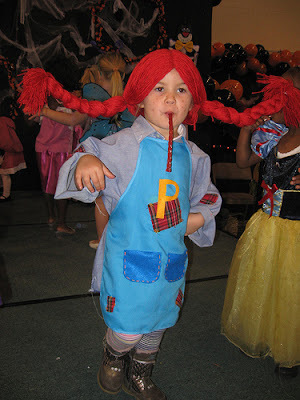 Previous: Pippi Longstocking. My bright and slightly obsessive son has been completely fascinated by Martin Luther King Jr's "I Have A Dream" speech since he heard it on a documentary we watched on MLK day. When he had the chance, he checked out a book entitled "Martin's Big Words" and read it over and over again. Then he hit the jack pot. 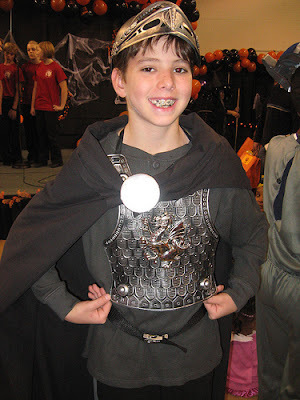 His class is learning about biographies and each student was tasked with a biography project to celebrate American history. He could've written a report, an essay, or a poem, or created a diorama. Can you guess which one he chose? Let's just say the kid can't pass up the opportunity to sit at the table and make crafts with me for hours on end. A diorama it was. He quickly came up with his vision for the project: Children of different races standing together with Dr. King in the background. Then I broke out the supplies to help him make it a reality. Javi did the coloring and decision making; I did the cutting, gluing, and rearranging. As he colored a public city bus or created buildings for the cityscape and trees for the park, we talked about Dr. King's message and why this particular speech resonated with him so much and how it affected the world we live in. But as educational as it was, the process was tedious, too. When your child lacks impulse control, gets frustrated easily, or loses track of what he's supposed to be doing, it can be difficult to move something from Point A all the way to Point B. I anticipated that when we started, so we sketched out a "vision board" that showed what he wanted the diorama to look like. That way, when he got lost in the details (like how his boy needed hair and a shirt and pants and shoes), he could orient himself and stay in control rather than try to slip me the lead and let me tell him what to do. We've been working on this diorama for two weeks. When we put the finishing touches on it tonight (it's due Friday -- so we're a whole day early! 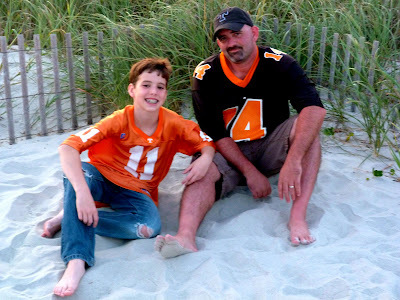 ), he was beyond thrilled with what he had created. "It looks like a miniature world in there," he said to anyone who walked past it. He kept fiddling with the boy and girl, worrying over the bus, trying to add detail to the trees. He's most definitely in love. And though he casually remarked that I did a great job on my project, after we sat down and talked about it, he realized this was his accomplishment. And then he asked me to "interview" him about it, because he's proud and enthusiastic and wants to remember this project. But as soon as I turned the camera on, he got all weird and robotic and sweaty (welcome to that generalized anxiety). We tried four takes and he finally made it through the fifth one. 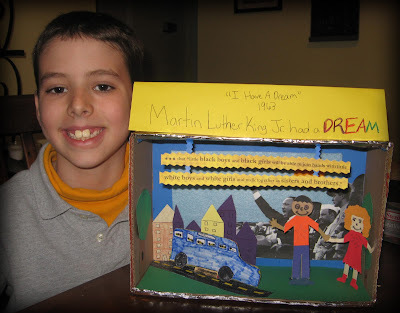 Through the video, I learned that my child's fascination with Dr. King has been replaced by an undying desire to make dioramas. Because that's what he's learned, you know. And guess what he told me when I gave him his hugs and kisses before bed? "Tomorrow we can start on Paul Revere!" 'Tis the season for make believe, harvest sales, and soup ... and we're loving it. 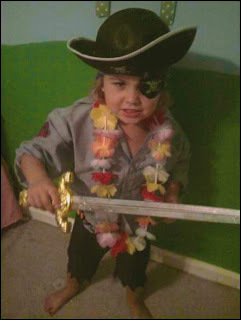 Last night, for no reason at all, Bella decided she needed to be a pirate. And so she was. Dressing her up in what we had around inspired me to share with y'all the neat little costumes we've put together over the years. I left out store-bought costumes (and there were several back-to-back years of Power Ranger and Spider-Man costumes). Note that I can't sew and I'm not a "crafter." 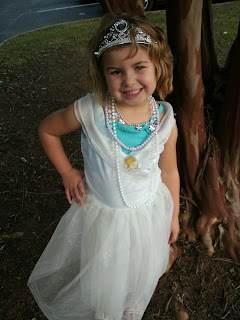 A little fabric glue here and repurposing there can turn disparate pieces into a costume that turns heads. 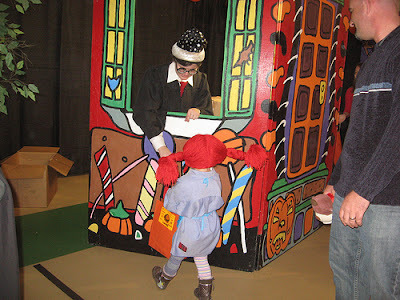 For instance, Bella's Pippi costume from last year landed us on the cover of the local paper. That's pretty good for a novice! I'll start with last year and work my way back in subsequent posts. Cut a P out of the yellow felt (for Pippi, obviously). Use a few rough, large stitches to attach the P to the apron with blue embroidery thread. Because the bee was still obvious from the back, I attached a flannel patch first, and then the P on top. Cut pockets from the blue felt. I cut the sheet in half, then layered it and cut the pockets at the same time. I used yellow embroidery thread to attach the pockets. Cut the sleeves at mid-arm from the shirt and use the scissors to fray the edges. Then fold up each sleeve and use a stitch to hold the fold in place. Add a few "patches" to the shirt and apron. Use yellow embroidery thread to make rough stitches holding the patches in place. Make sure you add a couple patches to the back of the shirt, too. For the hair: Divide the red yarn wig into ponytails. Secure them with a clear band. Braid the ponytails and use another clear band at each end. Stretch out a wire hanger and thread it through the wig. Then shape the wire to your child's head. 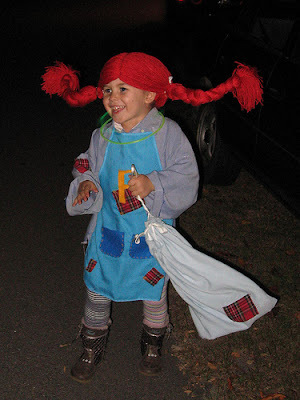 The long sock is meant to go over one leg of the tights to create Pippi's look of mismatched leggings. If you have garters, you could cut the legs off two different pairs of cloth pants. If you have several pairs of long socks, skip the tights and just use socks. We had tights and my sister loaned us a long sock, so we went with that method. For the pillow case: Cut a few slits around the top to thread shoe string. This will make your drawstring. Then add a few of the flannel patches. I suggest you cut the pillow case down a bit so the bag's not so big. I didn't do this, but it would've been better if I had. Coming up: A pirate, a knight, a wrestler, and an angel. after months of searing white heat. with exhaustion and worry and obligation. there'd be no getting back up. 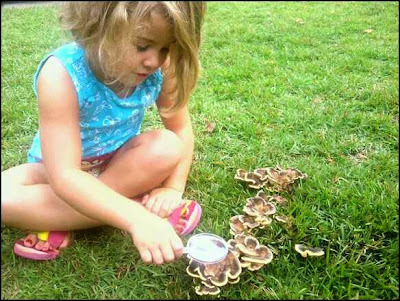 a magnifying glass and her imagination. and refused to hear "Not now." we found. Exhaustion had no place. in a life worth the work. This kid of mine. He's smart and funny. He makes the keenest observations and has the most compassionate heart. And he can lie like no other. Short of taping his mouth shut, I just don't know what to do. He'll lie straight to our faces. He'll be honest with someone else but will continue to lie to us. He'll feign innocence and cry about no one ever believing him as he continues to lie. He'll also lie about the stupidest things -- things that no one would believe and about which there's no reason to lie. Things that are obvious lies. Me: Are you eating cereal? The mountain man: Did you finish your chores? I just don't get it. Surely it's a phase, but my blood pressure skyrockets and my body goes rigid with anger each and every time. I refuse to raise a liar ... I just don't know how not to. If there's one thing my children will know as adults, it's how to make soup. When I was growing up, the go-to meal in our home was macaroni and stewed tomatoes. 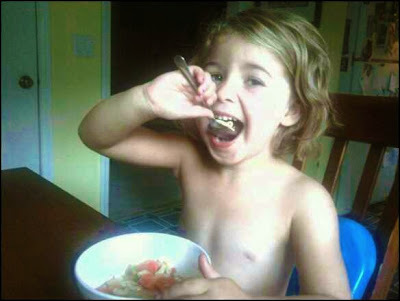 When all else failed, when there was nothing else to eat, there was macaroni and tomatoes. Plain boiled elbow noodles with plenty of salt. A can of whole stewed tomatoes, sliced into chunks by a knife right in the can. A pot of simple deliciousness warm on the stove, never running out. I don't eat macaroni and tomatoes anymore. I can never seem to capture the flavors the way my mother did. Instead, I throw together vegetables (sometimes frozen, sometimes raw) and broth. Add in some meat here, some cheese there, perhaps some rice or pasta... and a hearty meal is born. Sausage and kale, taco, chicken noodle, rice and bean, broccoli, potato ... the flavors and combinations are endless. I love eating it, making it, sharing it with others. And so last night, the first cool when we've had since early Spring, when funds were low and ingredients seemed sparse, I taught my daughter a lesson in making soup that warms the heart and belly while delighting the taste buds. 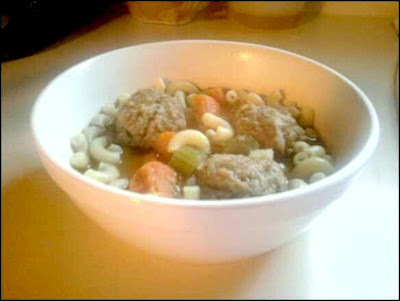 She stood at the stove as we pulled out what we could find: Two bags of frozen stew vegetables from the back of the freezer, a two-thirds full box of chicken broth, the last zucchini from the crisper, a half box of elbow macaroni, and the last of a bag of half-freezer-burned mini meatballs. And then I watched as she dumped and stirred. We added water and let the heat roll. She snuck raw zucchini as a I chopped it and then she added both the zucchini and the macaroni to the pot. We added a lid and set a timer so that I could pull her away from the stove. 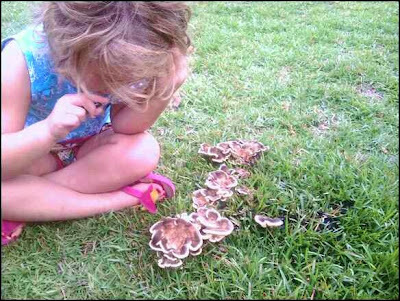 When the timer dinged, she ran back and smiled as we taste-tested until it was just right. The air warm with steam, we set the table with deep bowls, spoons, crusty bread, and a shaker of parmesan cheese. She supervised as I ladled. And then we all ate until our tummies hurt. I foresee a tradition here.